La Mom is headed to the good ole US of A this summer. And she isn't going empty-handed. 1) 15 different "flavors" of Le Petit Marseillais shower gel. With scents like apricot & basil and honey & lavender, I can understand why my friends are jonesing for it. 2) Speculoos pâte a tartiner, a.k.a. Crack in a Jar. So what if it's technically Belgian. Our lovely neighbors to the North have licensed their addictive bread spread for OTC use in France. You gotta love it when a product's main ingredient is listed as "cookies". 3) Ladurée scented candles. This is the next best thing to Ladurée macarons. And it will definitely last longer. Midway through the umpteen-hour plane ride with the French Fries, I'll be tempted to give them anything to stop the griping and air sickness, even fancy French pastries. Speculoos spread + two spoons = happy travels. What would you want La Mom to bring you? Rive Droite ou Rive Gauche? One more day to have your say -- and win an exclusive hand-printed Kasia Dietz bag! Send La Mom an email: lamom.paris@gmail.com. The most creative answer wins! I believe I'll have the pate - aka crack in a jar. . .yummy! But I can't imagine how you're going to actually make it home with that if you're bringing it in your carryon. I'd eat it all before arrival. 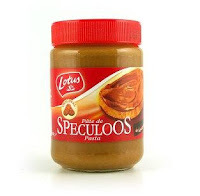 . .
Wow, is the speculoos thing available in Paris? It looks awesome! A return ticket to go back with you. @Bunny It will certainly get demolished halfxay through the plane ride. @Paris Paul You can get it in most mainstream grocery stores. Let me know what you think and we can set up the first Speculoo-holics Anonymous chapter in Paris. @Grammy Desolée! The tickets were super-expensive this time around so I can only spring for 4 people! That is really funny - I just brought some Speculoos back to the US as a thank-you to a co-worker, and I described it the same way, ie "crack in a jar"!! I live in Belgium and I agree that that nothing beats Speculoos paste! It's also the top of our list of requests for things to take/send back to South Africa when anyone goes over. You are a good friend, mon amie! I recently asked a friend to bring me back Speculoos, but he brought me the cookies instead of the spread - sacre bleu! I also find chocolate bars from Jean-Paul Hévin and bonbons from Jacques Genin make stateside friends happy. I usually bring back bottles of wine, macarons, éclairs au chocolat, and Milka chocolate bars... but maybe I'll bring some Speculoos back this time. Thanks for the great idea! A gorgeous, single Frenchman, please! hope you're enjoying your trip stateside! This is a great idea! I too am always on the lookout for great gift ideas to take back to family and friends once I finishing Learning French here in France! :) Thanks for the article! LOL, I just got back to NY from a trip to Paris with my suitcase stuffed with Speculoos, Petit Marsellaise gels (Mimosa, Lavender, Marine, mmmmmmm), Dia deoderant with the blue cap, Claire Fontaine notebooks and Haribo Haricroc. It's funny the weird little things that you miss when you can't get them anymore. Frenchy Friday + Kasia Dietz Winner!